Prob­lems with Win­SCP ver­i­fy­ing SSL signed cer­tifi­cates. 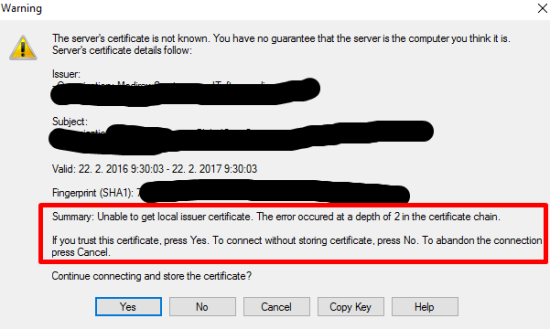 Unable to get local issuer cer­tifi­cate. The error occurred at a depth of 2 in the cer­tifi­cate chain. — Place it into the same fold­er as winscp.exe. — After that, you can conect with­out cer­tifi­cate warn­ings . This entry was posted in 2016, GUIDE, Internet, winscp.